Has "Persistent Contrails" Become the New Thought Blocker? Only those deeply entrenched in the truth movement, those that are dedicated to knowing and understanding the truth at any cost would truly appreciate what I'm about to say. Many people who look for truth ultimately find themselves in a conversation where they are ridiculed of being a "conspiracy theorist" or perhaps charged with speaking "conspiracies" by someone who is conditioned and trained to think by the very system we fight to expose. By now many if not most individuals who have found themselves in these situations have figured it all out. Yes, "conspiracies" and "conspiracy theories" is no ordinary word or phrase. It (the phrase) was officially adopted in the aftermath of the murder of president John F. Kennedy when CIA document 1035-960 which instructed its intended recipients on how to discredit those who questioned the JFK murder, or as the document states, those who entertain "conspiracy theories" about the murder. What this well planned out use of the phrase has done decades later is create a generation full of individuals who are physically, emotionally and mentally moved by this single term in one way or another. Amazingly, we can now observe and confirm the results of this experiment on humanity, and declare with certainty that the term is a thought blocker. It acts as a trigger word for many people who don't want to believe that their government would ever harm them or do anything that is illegal or immoral. For these individuals who live amongst us, the term "conspiracy theories" shuts off all critical and analytical thought and an emotional impulse shoots into the lower brain and literally takes over the decision making part. Those controlled by the phrase will react instead of analyze. This reaction is one of rejection of the information. This mass thought blocking phenomenon triggered by one phrase is, I believe, one of the great psychological accomplishments from government in the last one hundred years or so. It is likely that Edward Bernays, the founding father of propaganda, who served as an advisor with the CIA as well as other dignitaries, influenced many of the elements in document 1035-960 addressing how truth tellers or those who opposed government view were to be dealt with. Fast forward to our current times. Decades have passed and government has accomplished quite a few other conspiratorial crimes which have left their marks on humanity. Today, more than ever we hear accusations of "conspiracy" all over the mainstream media news. No doubt the phrase may have lost some of its power with so many people waking up to the reality of our corrupt leaders. Despite mass awakening, the phrase however, still does have its effect on many people's natural tendency and ability to resort to reason, logic and common sense. But, you may be wondering, are there other words or phrases that quietly may be carrying the same thought blocking capacity, that we may not be as aware of? Among all the issues that truth seekers seek answers on, the topic of geoengineering and chemtrails operations, which now span the entire planet, seems to have risen to the highest level of taboo and secrecy. If geoengineering is the mother of all conspiracies, which I argue it is, then you may wonder what tactics are currently being employed to keep the public in the dark? Our lesson here can be taken from history. Fast rewind back to the CIA document 1035-960, read and understand. I often say, look for the pattern first, then focus on the details. Government, just like a person, has a pattern of behavior that is easy to observe and predict. The reason we can observe and predict this pattern of behavior is that government, like any other entity, has every reason to repeat an action that is successful. This is a reasonable and logical deduction that when applied can be counted on to produce reliable predictive results. As in sports or any competitive event, if you do something that is successful you will likely seek to repeat the thing that brought you the success. This simple analysis can be used to arrive at some reasonable suspicions regarding government participation in the geoengineering of our skies and our planet. Those that are active and staying informed in the geoengineering movement know that there are many issues that together point to the fact that government is involved in dangerous and nefarious geoengineering programs. The means, the motive and the opportunity is all there. We have heard from whistleblowers and former federal agents, warning us of these programs. Critical thinkers and humble doubters of the more recent government alternative theories regarding the chemical spraying of our skies, have had plenty opportunity to step back and look at all the evidence available in light of the historic patterns discussed above. Among other things that I observe, I now clearly observe that the so often used term "persistent contrails" may itself be a thought blocking weaponized term, just like the term "conspiracy theories". Clearly this was carefully thought out before spraying operations went into a full go after the late 1990's. The "persistent contrails" phrase is being implemented on humanity in a manner referred to in psychology textbooks as 'classical conditioning'. During the 1890's Ivan Pavlov, a Russian physiologist, discovered that a response observed (in a dog) due to a particular stimulus (unconditioned stimulus) could eventually be reproduced without the stimulus (conditioned response) as long as the dogs made the association between the two stimuli. Likewise, "persistent contrails" may be triggering a conditioned response where the recipient associates the feelings they get when they hear the phrase "conspiracy theory". This association my then trigger a thought blocking effect. Although these two phrases differ in that "conspiracy theories" is designed to discredit the messenger. Both terms however, trigger a reaction in the listener which causes the listener to ignore what is being said. Association (with conspiracy theory) or not, the end result is the same. Like the "conspiracy theories" phrase, the phrase "persistent contrails" is designed to assure the listener that no matter what the activists is saying, you should ignore them and move on with your day because what they are saying is ridiculous unproven claims. With government having taken over science and reason as admitted by Obama in his election campaign in 2008, more than ever the individual must apply critical thinking skills that do not rely on what government "scientists" have to say. As I approach the conclusion of yet another observational chemtrails study, I have also raised my suspicion that the phrase "persistent contrails" may be nothing more than another weaponized trigger term. When I first heard the term, I found the argument and theory of 'persistent contrails' entirely unconvincing, but that is not the case for many others who would prefer to believe government wouldn't do such a thing. Among other things that convinced me, one of the greater (striking) comical truths was how the "persistent contrails" argument suggested that a normal plane using ordinary jet fuel was expected to block the sunlight intended for the earth and subsequently alter our entire ecosystem. That the Wright Brothers did not as much as event an aircraft for convenient high speed travel, but that instead they ruined the planet for good with their weapon of mass destruction capable of creating a global ice age and exterminating humanity. Ridiculous narratives such as these shine the light squarely on those that claim that this is the case. Though this argument (The exoneration of the Wright brothers conspiracy) is not necessarily rooted in hard facts it is rooted deeply in reason and logic. I believe the term "persistent contrails" is very likely now being use as a weapon on humanity as the controllers hope that people hear the term and look away from the issue for good. "Persistent contrails" offer the listener an unusual opportunity to relax and believe that their government would never do this to you. It shifts the battle field from the mainstream media (where it would get a lot of attention) to rapid private decision making. Given the world wide catastrophic spraying we are seeing daily including the massive stratospheric chem-bombs and the threat all of this means to the ecosystem, there is no more important term in the globalist playbook that seems to be giving the globalists a great return on their investment than "persistent contrails". Would the globalist gangsters miss out on a chance to spin a term on the public that would buy them enough time to take full control of the weather and give themselves "god-like power"? I don't think they would and for this reason we should be aware of this latest and most effective deception being employed by those who would have you say nothing about geoengineering and accept your fate. Let's counter the psychological effects of this term and force those that claim the spraying we are seeing every day is due to contrails, to prove their case. As I near the conclusion of another observational study to debunk the persistent contrails myth, I want to encourage activists who are passionate about this topic to challenge those who are using this thought-blocking term, and look for ways to regain the attention of those currently under the "persistent contrails" psychological spell. 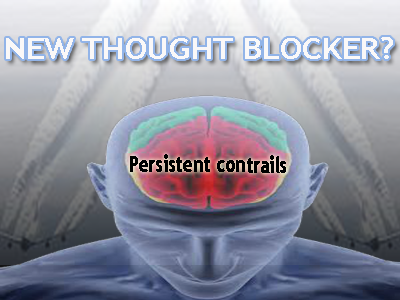 It isn't the first thought-blocking spell-bound term we have dealt with and it will probably not be the last. We have watched for the last decade, as the establishment searches for blind unproven theories to put out to the scientific community to explain the catastrophic results of the spraying program, and we are left with government "climate science" abstracts, papers and Youtube videos put together to deceive the average person into alternative pseudo-scientific claims to explain the sky spraying. We saw the same level of deception with regard to the global warming (pseudo) science as scientists for decades tried to recreate their understanding of climate based on CO2 (instead of the sun) as the primary global thermostat controller. That a tyrannical government has taken over the science should not surprise anyone. We've seen government takeover of science in almost every conspiracy from JFK's 'back and to the left', to massive WTC towers disintegrating at free fall speed due to deoxygenated office fires, to planes that disappear without a trace. No one should be surprised that there are other buzz words and trigger phrases amongst us. The important thing is to be true to yourself and purpose to critically analyze every piece of information that comes (especially) from so called government scientists or scientists whose work is promoted openly by Wikipedia, the establishment and by our own corrupt politicians. History has a long record for 'unpopular' science eventually being proven right and the politically accepted science being debunked. It's time we look at our political reality from a psychological point of view and remember that we are psychological beings open to being manipulated by the controlling systems. Only then will we be in search of new trigger terms, weaponized words, and deceptive phrases that are all engineered by design to keep you asleep in the matrix of lies where you can be easily controlled. Free yourself now of the cobwebs of psychological deception engineered by professional thinking systems that work for government who have collectively existed much longer than you have been alive. Let your free mind then explore the amazing world around us in a way that is uninhibited by government narratives whose primary goal is to keep you enslaved. Then, and only then, you will discover that the gift of free and critical thought is a beautiful thing.